As a society we tend to think that more is better. More megapixels must result in better photos. More square footage must mean a better apartment. More calories must mean a better meal. Often times–save the last–we are wrong. If you’ve ever attended the Sturgis Motorcycle Rally you likely noted the dizzying array of vendors, hucksters and hacks demonstrating the various trash-n-trinkets – more isn’t always better. And what if less is not only MORE, but a competitive differentiator when it comes to rallies? Thanks to Barry Schwartz we have a name for the phenomenon – the paradox of choice – a notion that posits that fewer choices make people’s buying process easier and they are happier with their buying decisions. 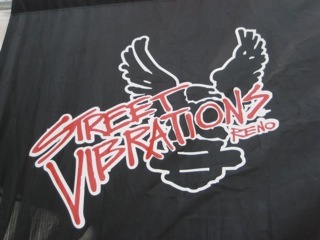 Street Vibrations in Reno is certainly no ‘big-box’ or mega outlet like Sturgis. And it’s only half the chaos of Laughlin River Run. That’s what I like about it! I have the view that people connect with motorcycle craftsman i.e. “artists,” not executives. We’re certainly not drawn to huckster hacks selling us on something we don’t need or want. Artists speak their truth, from deep down inside. They talk about their craft. The philosophy and inspiration behind it. Nothing is more powerful and you bond. It’s as if your listening to a song and feeling what the artist is expressing. And if the artist does this more than once, you become a fan. Clearly I’m a Street Vibrations fan. Largely because of the quality face-to-face time with the motorcycle craftsman – “artists” in the vendor booths. True, I’m also milking the last remnants of fall riding before the long cold and rainy winter sets in, but this motorcycle rally fulfills my entertainment, shopping, and information needs. So, as motorcycles roar out of the Northwest in route to Reno… I’ll be one of them. I’ve done this trip a number of times (blogged about in 2009 HERE; 2008 HERE; 2007 HERE) over the last 10 years. It’s never boring and always a great experience. Twenty-ten looks like we’ll be dancing between the rain drops for part of the ride as our posse helps bring the $$ to the local Nevada economy. 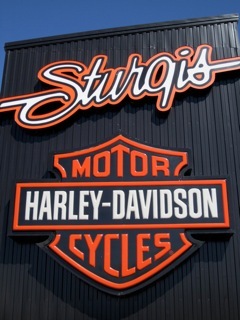 By this time you’ve likely read that this year marked the 70th annual Sturgis Motorcycle Rally. I returned earlier in the week and am just now getting back on the keyboard to ramp up some blogging content from the 12-day vacation. Wow, that went fast! For about two weeks I didn’t think about blogging, media organizations or watch TV other than an occasional weather update. Digital media influences our lives and influences society, but the disconnected wind in the face time was nice. Besides, the lack of AT&T coverage in and around Lead, SD made it easy to stay disconnected! The 70th Rally expected to spark a surge in both attendees and vendors. From my vantage it delivered. Early estimates are nearly half a million people flooded the tiny town of Sturgis and the surrounding Black Hills. Last year attendance was in the 380,000 range. For 2010 the intense influx of visitors brought vendors selling everything from patches, rally gear, handmade jewelry and tattoos. Harley-Davidson had a solid showcase of the new 2011 models and was well attended being in downtown Sturgis the first time in years. No rain outbound to Sturgis – 1200 miles of sunny/hot weather. First time through the Southern entrance to Yellowstone National Park (via Jackson, WY) – The Grand Teton National Park is incredible and reminded me of trips to the Canadian Rockies. Mount Rushmore achieved the highest single day attendance record. Officials stated that 17,600 people visited the national memorial on Tuesday (August 10th). The most in one day since the park started keeping track in 2000. The Black Hills were jammed full of motorcycles! Avoided the motel rip-off and thrash – stayed in a vacation cabin south of Lead in the Deer Mountain area. Attended the first ever Bob Dylan concert – Kid Rock saved the evening with a real performance. Face-to-face with Willie G., Bill Davidson and Nancy. – No they didn’t recognize me from the blog. Riding a motorcycle in a lightning storm… on the return trip… Not to let a little rain intimidate us in Montana, we drove on, only to find ourselves in a drenching downpour, complete with hail, thunder, and lightning. Who knew there so many motorcyclist survival lightning strike stories! I’ll be doing a detailed trip update shortly as I pull together my notes and VISA slips to remember where I was when. Saturday morning was a total rain out. Water hose style with puddles! The casino’s were very busy with patrons waiting on weather reports. By noon the showers had cleared and we headed out on our own mini CatHouse Poker Run in Carson City. It wasn’t raining, but it looked like it wanted to and it was cold riding. On the first stop of “Meet Famous People” tour I met Madam Suzette and Dennis Hof, owners of the Bunny Ranch and who starred in the reality TV show Cathouse: The Series on HBO. They do that “honest” living gig in the oldest profession. Watched “Air Force Amy” doing her gig with all the riders who would listen to the “give me your $$” banter. According to reports there are more than 500 women who work the ranch….all “independent contractors” who consider themselves a highly commissioned sales team! We made our way over to the tri-ranches; Sagebrush Range, Kit-Kat and Moonlite. It was just another day for these local “ho’s” I suppose…tough life in my book. There were live bands and we headed back to Reno to miss a shower ridden sky for the Harley dealership. A variety of food vendors, and race dyno’s were on hand throughout the dealer. We ate dinner in the Eldorado Hotel at the Hong Kong style Chinese restaurant called Golden Fortune. Leo has waited on our posse for several years now, but this year he was booked. An accident or choice? We’ll never know, but he did pay us a table side visit. Excellent dinner and the service was top notch! We ate enough food to have two heart attacks, but managed to waddle down to the craps table. Mac was on a roll hitt’n the hard ways, and many sixty eights till the pit boss even started looking nervous. Called it in early since we scheduled a 7:30am departure out of Reno on Sunday. The forecast was clear and 40 degrees so, we all had to find our winter riding gear and try and fit things back into the tour packs. More than 30,000 motorcycle enthusiasts roar into Reno, NV in September. This was the 14th year for Street Vibrations and the event is ranked as the 6th largest (whatever!) motorcycle event in the nation. Our posse made plans to do the 1200 mile round trip from Portland, OR. We decided on a route through/down I-5 to Eugene, OR and cross over the Cascades on Oregon 58 where we picked up US97 south to Klamath Falls. Eugene is located at the southern end of Oregon’s Willamette Valley. Its Oregon’s second largest city at 110,000 and other than the Oregon Ducks football, it has a lot of lumber and forest product focus. We arrived for lunch in Eugene then we hit OR58 eastbound to Oakridge. The highway passes several lakes, including Dexter Lake and Lookout Point Lake. We roared (literally) thru the Salt Creek Tunnel and continued on through forests of mostly lodgepole pines. Trucks heading to/from California are frequent and annoying on OR58. It seems this is the preferred route to Eugene instead of I-5 over the Siskiyou Summit. We continued over the mountains, to the summit of Willamette Pass, and then descended into central Oregon. The occasional store and lodging are about the only signs of habitat along the stretch of highway 58. It was a cloudy, cool day and we couldn’t see much of Three Sisters. OR58 ends at an interchange with U.S. Route 97 where we head south on US97. At dusk we should have foreseen huge clouds of bugs along the edge of Klamath Lake embedded themselves in our helmet and coating the windshield. More on the bugs in a moment. The Lake is about 30 miles long, eight miles wide and has a few areas where the depth is up to 60 feet. The Upper Klamath Lake is the largest freshwater body west of the Rocky Mountains. Now about those bugs…the Klamath Midge as locals call them, or Chironomous Utahensis for the research dudes who have thoroughly studied them. I call them a pain in the face! The Midge swarms occur every from May through September you can’t avoid them on US97 since the road follows the lake. There are 12 known species of midges in Upper Klamath Lake and I’m sure I took out my fair share. We finally reached Klamath Falls (bug ridden) and checked-in to a “Quality-type-Inn” near the quaint old-time downtown area. Most important was the mobile room furniture to drag out and post up for a refreshment. We walked the quaint old town area where we came across a Chinese food restaurant. WO…ngs, as part of the neon sign was burnt out. Great food even though they didn’t have a liquor license. After dinner we headed by Taxi to the Cowgirl Lounge and then to the eclectic King Falls Lounge where a Band of sorts was getting ready to play. I’m not a restaurant/bar reviewer, but King Falls was rocking. The Klamath Blues Society (President: Phyllis) was accepting walk-on musician’s and the place had patrons (social retards) from a local mental hospital moving on the dance floor. Or at least that’s what it seemed to me. We called it a night around midnight and I had a gut ache from laughing so hard.